Trigger Warning: Some of the topics covered may trigger painful memories, please ensure you have support in place. You’ve ended the relationship and think that the abuse is over. But the truth is you are witnessing a whole new level of evil you never knew existed. The first point about smear campaigns is that they probably started long before the relationship ended. They would have made subtle comments to friends, relatives, the children and even professionals (such as GP’s and teachers) belittling your parenting skills or implying you had some sort of issue (mental health, a temper, alcohol/drug). Even if there is an element of truth they make the statements to apportion any blame for the children’s behaviour or arguments directly onto you. Essentially they are offering a hypothesis for everyone around them to find evidence of. They are forming their army of Flying Monkey’s in secret. Trouble is you don’t know they have this opinion of you and so you act normally but they interpret it through this filter. For example, narcissist tells school that you have mental health problems. You turn up to pick them up one day looking a bit disheveled (as we all do from time to time) and because they have the “mental health” filter on, they jump to the conclusion that you are ill again. They may even record it in their own records. Therefore when the relationship eventually does end, it only takes a little push and everyone is falling over themselves to blame you. And all the while, you are oblivious to their actions and how opinions have been influenced so your normal and emotional responses to the pain and anger at all the conflict, adds more weight to the hypothesis and your character is darkened further and further. It is a very clever but evil tactic which you would never for one second be aware was happening. Secondly, the smear campaign is a projection of all their own bad behaviour. Everything they accuse you of is exactly what they are doing themselves. It’s all part of the smoke and mirrors. They deflect everyone’s attention onto you so that they don’t look at them. The closer people get to the truth, the more outrageous the allegations they will make to keep diverting attention. Thirdly, it’s all to discredit you and make sure they come out looking like the victim for putting up with you and the hero for “rescuing” the children. 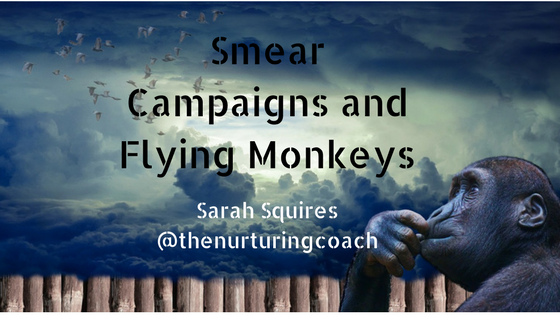 The Flying Monkey’s will scurry around offering sympathy and support, which the narcissists love and feeds off. Anyone who questions them will be ejected from the “inner circle” and equally discredited. The narcissists keeps feeding them tales of your devilry and the drama takes on a life of it’s own. Those who stay within the “inner circle” will remain because they are in fear of the consequences of disagreeing with them. The narcissist will use anything at their disposal to ensure their obedience, including access to your children. People will go along with the alienation, because they know if they don’t it will be them who is alienated. The narcissist makes it a dog eat dog world. At this point the narcissist is thriving on the attention but will go too far. Give them enough rope and they will hang themselves. Their tales will become taller and more unbelievable. People will begin to question them and the narcissist will begin to unravel. At this point they will ramp up their hatred of you and could even turn violent. It’s essential you keep yourself safe if you recognise the signs that they are unravelling. ← How the narcissist can fool even an "expert"
Wow…how well you have captured them…such a messy situation described so neatly and easily to be understood…now I know how to describe these people in a way that doesn’t tie me up in knots and takes so long and is so confusing that even the most patient of people find it testing and confusing…. Hi Rusty, thank you for your comment. I am really pleased you found the post useful. It can be really hard to describe to anyone who hasn’t experienced it for themselves. I wish you all the best.